Of course it’s a bag. If it’s not an Apple product or a pair of boots, then the obsession is inevitably a bag. Technology is amazing to me – beautiful, aesthetic technology that keeps everything in one place and is connected to everything amazes me. I don’t care what anyone says or how big brother it is, or if they are accessing all of my personal information, I still love you Apple and all your products. Please don’t go away. Boots – I think the obsession is derived from the inner farmer/horse rider in me. Inner person. No horse riding or farming as of late, but that could change in 2012. Back to the obsession – bags. It is suffice to say that this technology/inner farmer lover would need something to either A) carry all her technology in, B) carry her farming tools/veggies/horse snacks in or C) Both. 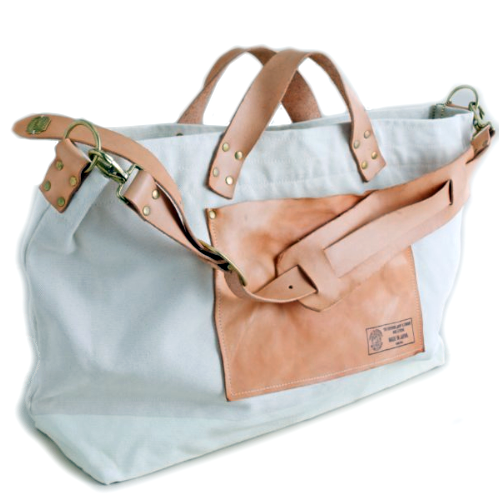 Enter The Superior Labor Bags made in Japan. I stumbled on to this bag on Pinterest. Of course, no brand listed but as any true obsessive will testify, I had to find out. I searched high and low. Thank you Google. Where would we be without you? You have provided me with the details of so many bags, boots, song lyrics, movie quotes, movie titles, how to, DIY, recipes,etc. I am forever in your debt. Anywho, I love these bags. Nostalgic, simple, clean lines, canvas (I’m not sure what it is but I LOVE CANVAS), two kinds of carrying straps, exterior pockets. Could it get any better? Too bad you can’t really find the one I want in the U.S. Or maybe it’s not too bad. They do retail for around $300. Ouch. Anyone travelling to Japan anytime soon? Give a girl a heads up. I think I hear a bag calling my name. This entry was posted in Today's Obsession and tagged Apple, apple product, Bag, Boots, Japan, Obsession, The Superior Labor, travelling to japan. Bookmark the permalink.